I was looking for inexpensive, condensor microphones to mix acoustic cymbals with electronic drum machines. There seems to be 2 suggested ways to mic cymbals. One is with 2 microphones in a 'stereo' configuration high over the entire drum kit. This is particularly useful with a completely acoustic set, as it also picks up some of the sound from the drums. The other method, which I chose, was to suspend a microphone over each junction of a pair of cymbals, plus a one over the high hat. Condensor microphones were the mic of choice for both of these methods, as they tend to be able to capture higher frequencies, and being more sensitive, can be further away from the sound source. There are quite a few choices out there in my price range, and Behringer seemed to be one of the more recommended ones, along with Audix and CAD. Of course, there are much better microphones than all of these out there, but at a much higher cost. I only considered 'unidirectional' microphones (cardiod pattern) so I could attempt to control what each mic picked up. I got samples of all 3 brands to compare them. 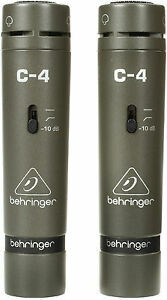 The advantage of the Behringers was that they come as a matched set, useful for 'stereo' recording. The set is in a nice, plastic case, with cutouts in the foam for the parts. There are the 2 microphones, 2 mic mounts, 2 foam windscreens and a 'stereo bar', which allows you to mount the 2 mics on 1 stand. The microphones are solid and seem well built, and are amazingly small and light. Each microphone has a switch on it, which allows you to filter off some of the lower frequencies, useful in 'noisy' environments, and in the 3rd position, 'pad' the microphone (reduce the overall level to avoid overloading the sound system). One surprise was that the mic mounts were optimized for 'small' stud mic stands instead of the 5/8" studs I'm used to. The mounts do have both size threads, but the 5/8" ones are rather shallow. They will work on a standard stand, but work better on a small stud stand. The stereo bar has the small studs to mount the microphone clips, and the 5/8" socket to mount the stereo bar on a standard stand. It comes with a screw in adapter so as to be able to mount the stereo bar on a small stud stand as well. I was able to use that adapter on one of the studs of the stereo bar to mount a 5/8" microphone next to one of the Behringers for comparison purposes. Being condensor microphones, they need a source of 'phantom' power (provided over the mic cable). I plugged these into a small Behringer mixer which has inputs, phantom power and pre-amps for 4 microphones in addition to 4 stereo pairs of other inputs for the drum machines and other sources. So how did they perform? Not so well. There were 3 things I looked at: Frequency response, noise and off axis rejection. These microphones seemed to pick up the sounds in the cymbal range of frequencies fine. I was able to adjust them so they picked up only the cymbals they were supposed to and not any of the drum pads. However, there was sort of a high, 'ambiance' noise which I found disturbing. As far as I could tell from the specs and appearance, these seem to be the same as the C-2 except for color. See my review of the C-2 which faired much better. It seems odd to have a different model number just for color. Perhaps this model is 'cheaper'. Or this particular set was defective, as Behringer has proven they can do better in this size/price range. If you are looking for mics to record instruments (especially acoustic ones) and you are on a budget (and have a powered mixer or recorder), these are not a bad way to go. They tend to not give as high of a SPL as I would like, which means that once they are brought up in the mix, there is a little bit of noise in them. However, most of that can be taken out of the waveform digitally using Adobe Audition or similar software. Having said that, however, they are probably some of the best mics for acoustic instrument recording you're going to buy at this price. Thought I would try these out because of the price and was not expecting much, but was pleasantly surprised at how good they sounded. They seem to work great for acoustic guitar.